I loved every single day of your month of gratitude! The stories were interesting and so well written. Reading your posts always brings a smile to my face. Thank you for making my days brighter with your marvelous insights. 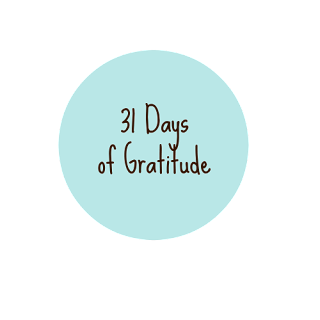 I have loved reading your month of gratitude. I have also been writing in a gratitude journal (trying to change my mindset to look at the positive events in life). Your postings have been an inspiration. Thanks for sharing! Joan, your series has resonated with me. I agree that gratitude can "wear down the edges" of worry and anxiety. 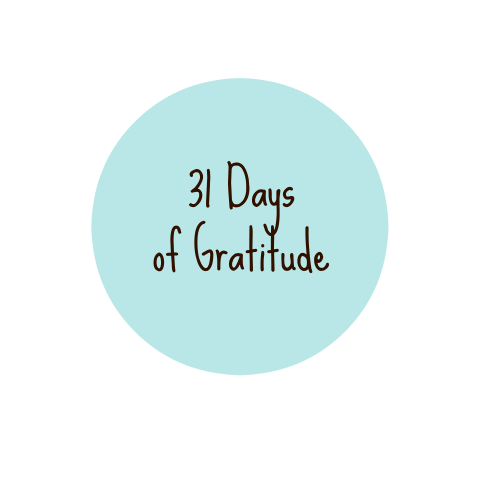 I have found gratitude to be a wonderful coping mechanism when I begin to have panic, grief or worry (usually in the dark of the night). Counting the blessings in my life one by one gives immediate relief and balance. After reading this series, I am encouraged to dig deeper as I add to my own life of gratitude. Thank you Joan for your humor and strength of character. You took the edge off for many of us. I'm glad it worked for you and I hope it will stay with you for a while. When it starts to wear off, do it again. I used to write in a gratitude journal every night. That was when I was very stressed from work. Work stress is small potatoes compared to some things, but it wears you down. Hi Joan! As always, your emails make my day. Some years ago I found your writings when you were blogging about your Mom (and other thing, too) but at that time what you were writing was just what I needed. Now I feel like I know you even better and am glad to be a part of your life still. For me, I just need to remember to be grateful AND use the muscles in my cheeks to turn up the corners of my mouth!! Look at your smile! It's contagious, it really is. Thanks so much. Thank you for sharing from your heart, each one touched me in a different way. It's been a bit of a busy month for me what with one thing and another, including my dad dying very suddenly, but I wanted to take time to say how much I enjoyed reading your Gratitude posts, even if I was usually catching up several at a time. You have such a gift for writing, Joan. When I feel a bit more normal again I'm hoping to come back and re-read some of the ones I paid less attention to. I found the one on depression very moving. Having a sister ten years older than me who was anorexic and severely manic depressive through most of my teens, mental illness was very much just a part of normal life for me but I know there is still far too much stigma attached to it in society at large. Joan, I loved this series. You've hit on the secret to happiness: being grateful for what you DO have, not thinking about what you don't have. We all have so much, if we just pay attention and deliberately feel grateful for it. I'm grateful for all the smiles you've brought to me by your wonderful writing. Thanks so much for doing this series and sharing it with us. Each day you made me stop and appreciate that it's all the little things that matter the most in life. And that we're all basically the same. And that world peace would be a dream. P.S. I was wondering if you could find it in yourself to be just a teeny bit more grateful in the not too distant future? She said with hope in her voice.